I’m experimenting with LEDs and cross stitch for a new project, trying to figure out how to incorporate LEDs into cross-stitched alphabets. Because some of my first cross-stitching was not on Aida cloth (the fabric you see here, which has regularly spaced openings), so far my letters have been improvised and a bit crooked. The stitches on this lowercase ‘o’ are too spaced out–the crossed stitches are supposed to be right next to each other so you don’t see any of the white cloth. It looks like the size of the LED is going to determine the size of my alphabet for this project. The stitched letters are turning out smaller than I thought. 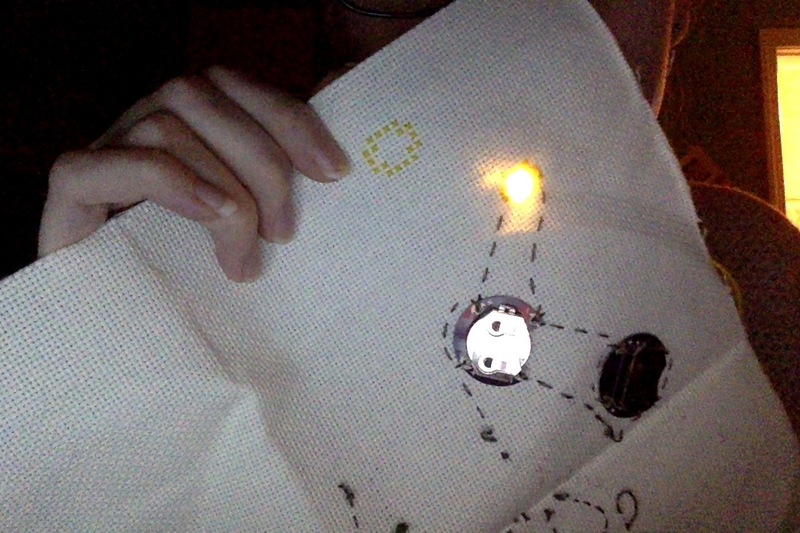 This yellow LED is running off one battery on some scrap fabric. I’m trying to figure out the best way of covering up the LED with embroidery floss so that the light diffuses in a warm way and so that it doesn’t stick out like a sore thumb amongst the even, grid-like cross stitches. I’m discovering handy tools like this simple, but useful, pattern designer: http://craftdesignonline.com/pattern-grid/, which is where I got the letters above. I also really love learning things the hard way. 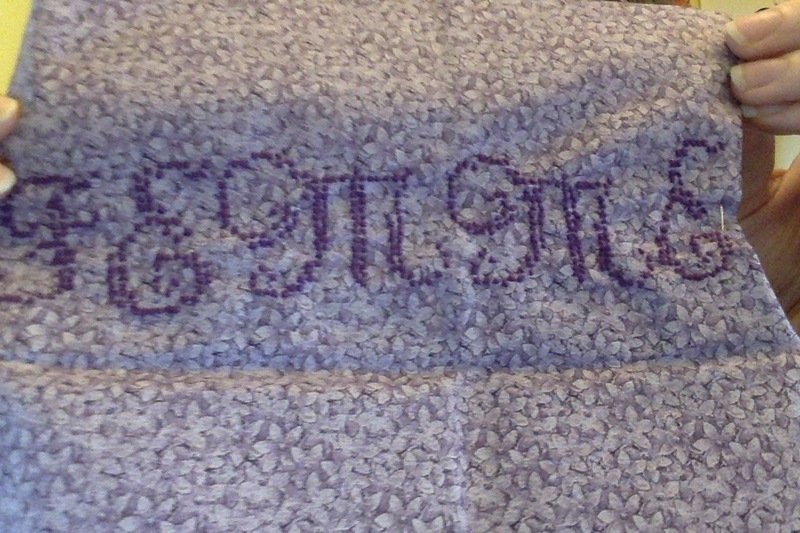 My first attempt at cross stitching letters is on scrap fabric from the thrift store. Will most likely turn this into a patch, although I’m thinking about mounting it on some dark denim. Meanwhile, working on “Making (Queer) Love: A Kit of Odds and Ends”! More soon! 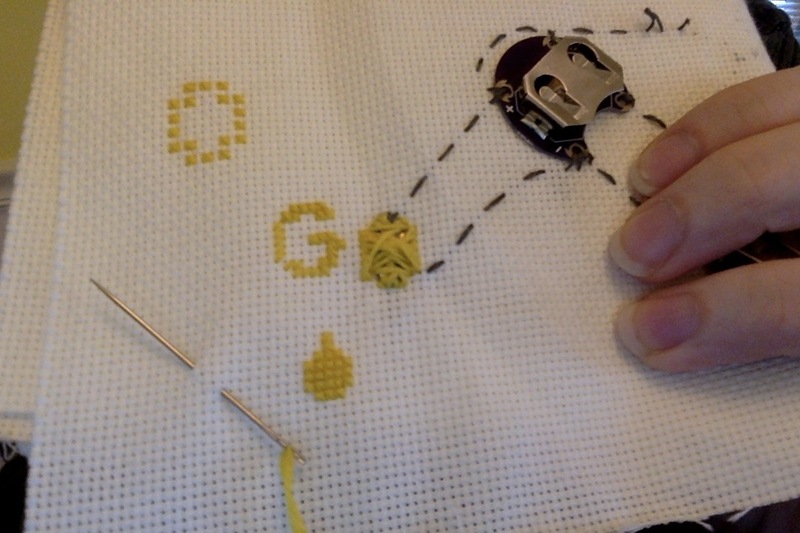 This Post was posted in Uncategorized and tagged crafting, cross stitch, etextiles, femme, practice, process, projects, soft circuits. Bookmark the permalink.